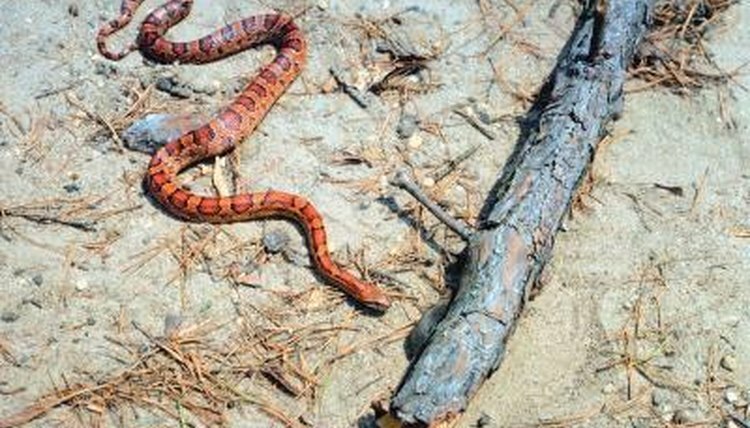 Corn snakes grow to lengths of up to 4.5 feet and are generally considered an easy snake to keep in captivity due to their tolerance of human interaction and their relatively low need for food. If your corn snake has recently laid eggs, they may eventually hatch into baby snakes, but they have a long way to go before this happens. Corn snakes have the ability to produce quite a few young snakes per breeding session. The typical corn snake clutch contains roughly 15 eggs, almost all of which will hatch if conditions are kept right. Once the eggs hatch, the young snakes will quickly acclimate to their environment. Corn snakes come out of their eggs ready to eat and explore. If your snake has already laid her eggs, they should be placed in an incubation container with a lid. This container needs a moist substrate base -- peat moss, perlite, and ready-to-use hatching substrates are available at most pet specialty stores. The incubation container must be kept between 78 and 84 degrees Fahrenheit, and the eggs will take 58 to 62 days to hatch. Once hatched, snakes may remain in the egg for a few days soaking up its nutrients. Even baby corn snakes can eat a small pinkie mouse. Snakes will be hungry after emerging from their eggs and should be fed as soon as possible. A clutch of 15 eggs can consume around 30 mice per week; two mice per snake per week should be sufficient to keep them healthy and growing. If the snake doesn't seem to want to eat, you can try cutting a pinkie in half to make the meal more enticing and easier to consume. Baby corn snakes should be separated into their own small containers with water to drink and a simple substrate. Include a piece of newspaper for the snake to hide under and keep the containers in a temperature-controlled area away from chaos and noise. Small containers are best for baby snakes, as the babies are more sensitive to temperature changes than adults and it's easier to manage temperatures in a small space. Corn snakes are mostly solitary and prefer to have their own enclosures.